NEW BRITAIN - The CREC Academy of Science and Innovation will be hosting the first robotics competition of the season for schools in the state on Saturday from 9 a.m. to 5 p.m. This will be the first time that the competition will take place at the Academy of Science and Innovation. 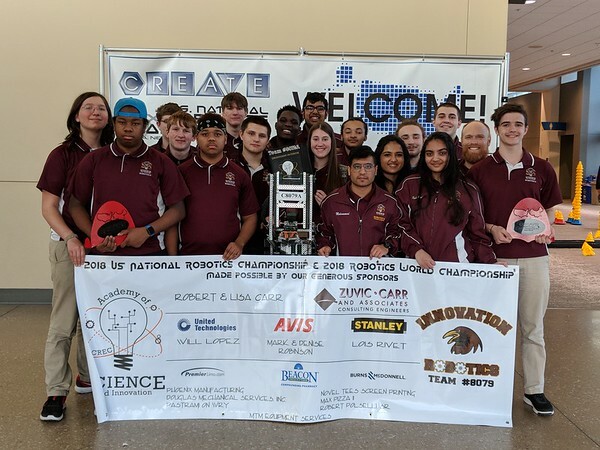 “We will have probably have 40 to 60 teams from throughout Connecticut and this will set the stage for the season,” Robert Polselli, robotics coach and engineering teacher at ASI, said. The season will consist of one to two competitions per month until March, when the teams enter the regional competition in Massachusetts. Polselli said the start of the season is a very exciting time for the ASI VEX Robotics team. Last year, the team made it to the 2018 U.S. National Champions. During the competition, students are given a challenge. They have to build a robot to meet the challenge most effectively. The challenge is different every year. ASI has five teams competing this year and each team has a robot. There are two middle school teams, two high school teams, and a team of sixth- and seventh-graders. The ASI VEX Robotics team was invited by the Chinese Asia Pacific Competition group to go to China to compete in its competition. The Chinese group saw the ASI students last year in the national competition. The goal is to send from 15 to 20 students to China at the end of January. At the competition in China, ASI’s team will be the only U.S. team. Mana Mathew is one of the students who will be competing this year. She said she has built a number of life skills while preparing for the competition. “I noticed how much I have opened up learning how to be professional on emails and talking to teams and working with them,” Mathew said. Radha Patel is another student part of the robotics team. Patel said that when she first joined the team last year it was stressful because she didn’t have experience with robotics. “We learned quickly, and not only did we learn about robotics, we learned life skills,” Patel said. Petel and Mathew agreed that the bonding created within the teams is one of their favorite parts of competing. Polselli said that competing for world skills and not for grades is one of the most important things about the competition. “There is no better motivator than to say you’re going to be on stage in front of everyone and your performance is not going to be measured by a grade or a number. It’s going to be measured by your true performance under stressful situations,” Polselli said. To learn more about the ASI VEX Robotics team, contact Polselli at rpolselli@crec.org. Posted in New Britain Herald, New Britain on Wednesday, 24 October 2018 20:58. Updated: Wednesday, 24 October 2018 21:01.